What is ventilation & Ventilator ? Ventilation is the movement of air, Perfect definition of its to removing contaminated air from the workplace. And Ventilator is device that will remove contaminated air from the workplace by the mech. & Electrical Energy. Exhaust fan & Mech. Vents are traditional type ventilators. 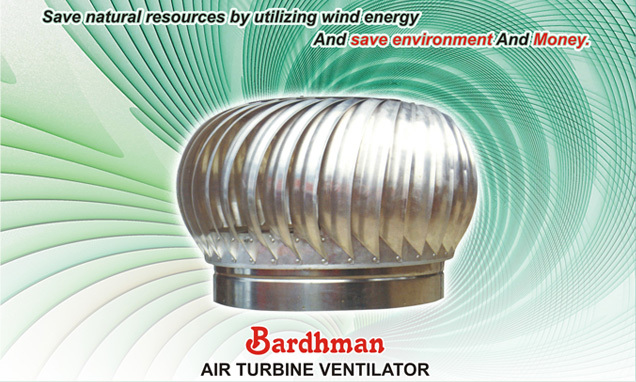 Bardhman Air turbo ventilator developed by us based on Korean technology and it is a revolutionary concept & completely non-conventional Device. It’s having self-lubricant Teflon bush and blades are fabricated with special grade aluminum or stainless steel & Venture doom made from UV based fiber glass. Ventilator having different parts like Top & base Ring, Shaft & Axel, Turbine Wheel & Blades. Self Lube Bushing, Venture Dome, Bushing Seal etc. Base Dia Exhaust Dia Temp. Diff. 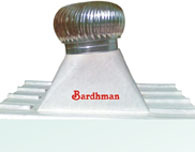 Bardhman turbo ventilator provides a safe, cool, healthier and more controlled work environment in following with proper analysis and installation process to ensure 100% effective performance.